Whats the best way to get to Imperial hotel from Disneyland hong kong? Whats the best way to get to imperial hotel from Disneyland hong kong with our luggages? We are 3 adults and 2 kids (2 yrs & 7 yrs). Comments for Whats the best way to get to Imperial hotel from Disneyland hong kong? we are three member's ,2 adults 1 child pls advice the way to Disney land from imperial hotel and back to hotel. Re: Whats the best way to get to Imperial hotel from Disneyland hong kong? The Imperial Hotel Hong Kong is a 3-star hotel very conveniently located at 32-34 Nathan Road, Tsim Sha Tsui, Kowloon, Hong Kong. About 6 minutes walk to the TST Star Ferry Pier and Avenue of Stars at TST promenade. Here's the most efficient way to travel between The Imperial Hotel Hong Kong and Hong Kong Disneyland which is thru MTR trains. 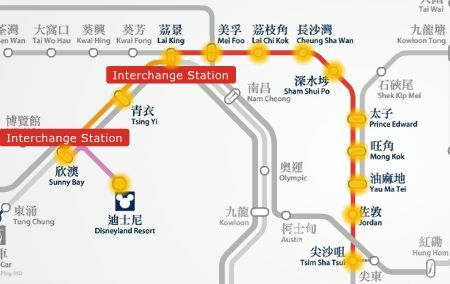 Get into the Disneyland Resort MTR station (about 3 minutes walk from the resort entrance) and take the Disneyland Resort Line train to Sunny Bay station and get off there. Interchange trains to the Tung Chung Line going to Hong Kong station and get off at Lai King station. Finally, interchange trains to the Tsuen Wan Line going to Central station and get off at Tsim Sha Tsui station (39 minutes @ HK$17) and then take Exit E, the hotel is just right in front across the Nathan Road (please refer to the map above). * As long as you can comfortably carry your luggage, there's NO problem in taking the MTR trains but if you opt to take the taxi which is your second option, it will take about 40 minutes drive @ HK$200 plus HK$5 / pc of luggage from Disney to the hotel. Hope this help and welcome to the City of Life!